When: Saturday, December 5 FROM 3:00 p.m. until 10:00 p.m. 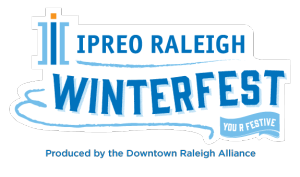 The Downtown Raleigh Alliance and the City of Raleigh are excited for the return of the annual Ipreo Raleigh Winterfest. This premier downtown event features live music, food trucks, the Mayor’s Official tree lighting and more! The 40-foot holiday tree in front of the BB&T building will be lit by Mayor Nancy McFarlane at 7:00 PM. Enjoy games and rides for the whole family. This year, we are introducing the Super Slide, Food Lion Grocery Cart Races, Balloon Toss, and Fishing Game. Take a whirl on the Ferris wheel and carousel! Ride and game tickets available for purchase on site. Find Santa in his village from 3:30 PM – 9:45 PM. Remember to bring your camera for pictures! View the Gingerbread House creations on display at the Wake County Express Library on Fayetteville Street and vote for your top three favorites. Winners will be announced between 8:30 PM – 9:00 PM. NEW this year is the Silent Auction! Take your favorite Gingerbread House home by placing the winning bid. A portion of the proceeds will be donated to Triangle Family Services. Participate and submit a Gingerbread House for a chance to win great prizes! The registration deadline is November 18. Families are invited to take part in the interactive story telling provided by our friends at the Express Library. Take a glide across the beautiful outdoor ice skating rink! Cost: $10. Open through January 31! Enjoy culinary creations from these food trucks: Pho Nomenal Dumplings (winner of the Food Network’s The Great Food Truck Race) D’Burritos, Annelore’s German Bakery, Oak City Fish and Chips, Chris’s Peanut and Candy Company, Wandering Moose and Taste of NY Hot Dogs. Adult beverages will also be available. Live music will fill the Plaza during this spectacular event! Lineup to be announced soon. We need YOU! Sign up to volunteer! Enjoy the merriment of the season with us. For more information and updates, please visit: www.RaleighWinterfest.com and use the hashtag #youRfestive to share your Winterfest pictures!